Simplicifolia Group: Characterized by glossy, mid-green, lobed leaves which form a compact mound. Open, airy flower panicles are followed by ornamental seed heads which provide additional seasonal interest. Slower to establish than the Arendsii Group, requiring about 3 years to reach maturity. The flower color is salmon pink and the flowering period is from about July to August. The leaves are green and about 20 cm. high. This plant is suitable for gardens with several (nearly) mature trees and shrubs. Calls for a spot in partial shade and a nutritious, humus rich soil with few roots in the local area. This plant is also used as a border plant (on a slightly sunnier spot). Soil should be moist or well. Hardly invasive and can be combined with other plants. It is clump-forming flower This cultivar has branching racemes of pink-red flowers on reddish greeb stems in July of August. 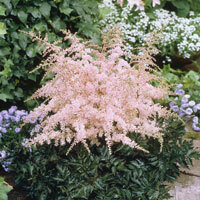 It is a bold, free-flowering perennial with finely-cut foliage. Use in the shade garden with other bold-leaved perennials and late bulbs. 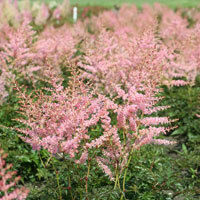 This variety is a star flowered Astilbe. It’s compact and graceful. These plants are low growing and packed with shiny green leaves. Henny graafland is part of the simplicifolia group, which is known for their fine textured foliage. Good cut flower. The leaves are green and about 20 cm. high. It is suitable for gardens wit several (nearly) mature trees and shrubs. Calls for a spot in partial shade and a nutritious, humus rich soil with few roots in the local area. This plant is also used as a transition to the rock garden and in places with little more Sun Soil should be moist or well. Hardly invasive and can be combined wit other plants. It is an herbaceous perennial grown for its tolerance of shade, dependable bloom, plush spikes of flowers, and dwarf mound of toothy leaves. It blooms in summer at the top of slender, upright to nodding stems that have airy branches. 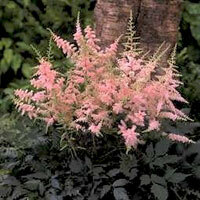 Tiny, closely packed, pink flowers clothe the spikes, transforming them into plush plumes. When the flowers dry, the spikes can remain attractive into autumn, thanks to their shape. 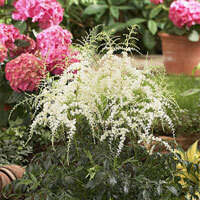 ‘Jacqueline’ prefers partial shade and fertile, well-drained, moist soil. It tolerates more sun and drier conditions than most astibles. 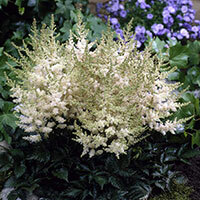 A plant of striking contrasts, this neat little astilbe displays short broad plumes of pale-pink flowers, which droop a little over very dark, glossy, finely-cut foliage. Pink-peach, graceful, arching plumes. Deep, rich green foliage is finely dissected, and crinkly-edged. Open, airy panicles of star-like flowers are followed by rust colored, ornamental seed heads which provide a few additional monthes of inerest. Slower grower. This perennial thrives in moist, shady locations and is polular for border plantings or alongside water areas. Arching, fluffy plumes of pale apricot/pink in July. 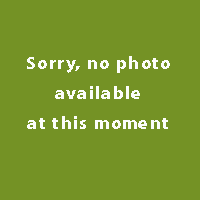 It has very glossy dark-green leaves. It prefer part shade and a rich moist soil. Perfect plant for the shady perennial border or specimen planting. Also great for edging a walkway. 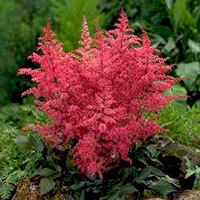 Astilbe thrives in moist soil high in organic matter and a shady to partially shaded location. A very hardy and reliable performer. 'White Wings' has deeply cut shiny leaves and feathery plumes of white flowers in summer followed by rusty-brown seed pods that remain attractive into winter. This compact plant makes a nice ground cover in the shady garden or can be used as an edging or in the front of the border. White wings should be grown in moist, organic soils and will tolerate acidic conditions. The flower color is light pink and the flowering period is from about July to August. The leaves are green and about 10 cm. This plant is suitable for gardens wit several (nearly) mature trees and shrubs. Calls for a spot in partial shade and a nutritious, humus rich soil with few roots in the local area. This plant is also used as a transition to the rock garden and in places with little more Sun Soil should be moist or well. Hardly invasive and can be combined wit other plants.